This VonShef Digital Slow Cooker from Domu, is simple to use and easy to clean. I was a little concerned I might not get it right first time, but I should have known better; I already have a VonShef 3-in-1 blender, which I use all the time. In my experience, Domu stock reliable products at an affordable price. The slow cooker instructions were clear and the execution easy. It has three heat settings and a digital timer. The shiny black crockery pot is quite handsome in its own right and is the embodiment of a slow cook casserole dish. The toughened glass lid allows you to easily see what’s going on inside. It’s a large 6.5 litre pot with plenty of capacity for joints of meat and loads of vegetables. Being a vegetarian, I opted for the latter. It’s ideal for large families, for batch cooking and freezing and for entertaining. There’s something deeply reassuring about going out to work, safe in the knowledge there will be a piping hot and delicious meal waiting for you on your return. If this appeals, have a go at your very own pot luck with the Von Shef Digital Slow Cooker giveaway below. Christmas is coming, in case you hadn’t noticed and a slow cooker is a great way to recycle all those Christmas leftovers. With a RRP of £49.99, it’s good value for money and even better, Domu are currently offering it for £29.99. It’s pretty much the end of the season down at the plot and a good time to use up the odds and ends from the garden. Shelled runner beans and wonky carrots that would never make it to the supermarket will do very nicely in a slow cooker vegetable stew. In fact the only vegetable that went into the stew that we hadn’t grown ourselves was the onion. The wonderful thing about garden stews, is that you can add pretty much whatever you like to them. So chuck in your beetroots, celeriac or swedes and feel free to add some kale or cabbage into the mix too. It’s a great way to use up marrows or overgrown courgettes too. I do like a good dumpling with a stew. Often I add cheese to mine, but this time, I decided to keep the dish dairy free and vegan by way of a change. So instead of adding cheese, I added some mushrooms instead. The smells wafting up from the kitchen were so enticing, I had to refrain from rushing down and taking the lid of to give an addictive stir. Not recommended as you want to retain as much of the heat as possible while cooking is in progress. My slow cooker vegetable stew was rich and flavoursome, further enhanced by the mushroom dumplings. In all the excitement of my slow cooker extravaganza, I forgot to add the baking powder to the dumplings – oops! This meant they were not quite as light as they should have been. Luckily, they were still very tasty. As I’d made enough for at least six people, I was planning on putting some away in the freezer for a rainy day. However, as the weather was thoroughly wet and miserable anyway, we ended up feasting on it for the next two nights. A slow cooked vegan vegetable stew using all the odds and ends from the late autumn plot. Mushroom dumplings complement this already rich and flavoursome dish. Pour the oil into the bottom of the slow cooker, then scatter the onions over. Roughly chop all of the veg and add to the pot. Add the herbs, garlic and chilli and sprinkle on the salt. Add the passata, wine and water. Cover and set the cooker to slow for 7 hours. Stir the ingredients together with a flat bladed knife. Add just enough water to bind them together, using the knife all the while. Take walnut size pieces and roll into balls - I made 11, but you could easily get 12. Take the lid of the slow cooker about an hour before it's due to stop. Give it a stir and place the dumplings over the top. Replace the lid and leave well alone until the cooking cycle has finished. Substitute whatever vegetables you happen to have on hand for the ones listed here. If you want to include dumplings, you'll need to add them about an hour before the end of the cooking time. You will find plenty of delicious recipe ideas over on the Domu slow cooker recipe hub. Mine should soon be one of them. I’m sending this vegan slow cooker vegetable stew to Jac over at Tinned Tomatoes for Meat Free Mondays. It would be hard to cram in any Extra Veg so this also goes to Helen at Fuss Free Flavours and Michelle at Utterly Scrummy Food for Families. This also goes to the Slow Cooked Challenge with Janice at Farmersgirl Kitchen and Lucy at Baking Queen. As many people would put the wonky carrots, overgrown courgettes and giant runner beans in the compost, I’m sending this off to It’s Not Easy Being Greedy for the No Waste Food Challenge normally hosted at Elizabeth’s Kitchen Diary. This month’s Vegetable Palette is the colour white and as I had lots of lovely white runner beans, as well as potatoes, I’m sending this off to Shaheen at A2K – A Seasonal Veg Table. 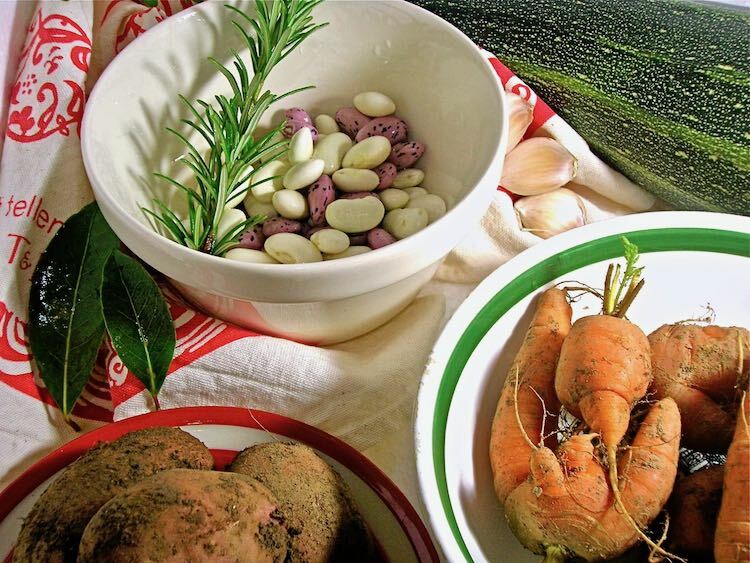 The bay, rosemary and thyme in this wonderful vegetable stew makes it just right for Karen’s Cooking with Herbs over at Lavender and Lovage. 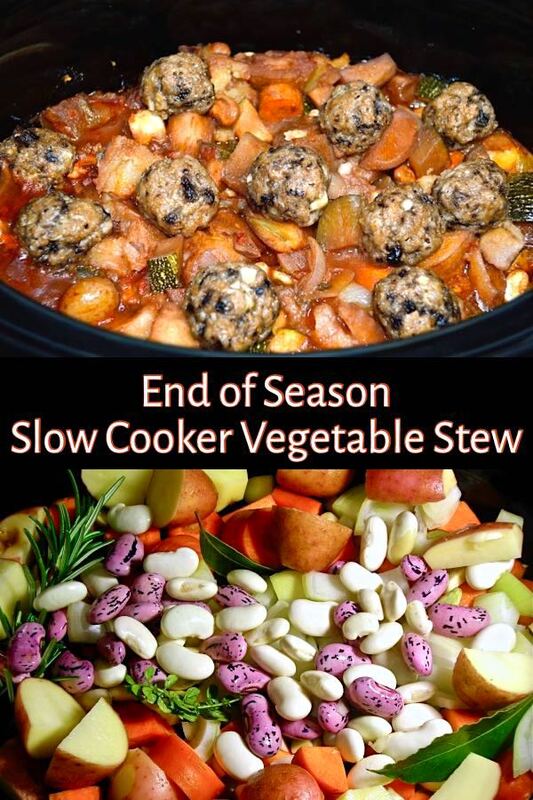 If you make this end-of-season vegetable stew with or without the mushroom dumplings, I’d love to hear about it in the comments below or via social media. A photo is always good too. For more delicious and nutritious recipes, follow me on Twitter, Facebook, Instagram or Pinterest. 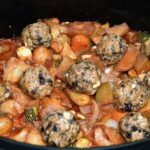 Slow Cooker Vegetable Stew. PIN IT. Thanks to Domu for the slow cooker. There was no requirement to write a positive review and as always all opinions are my own. Domu is kindly offering one Tin and Thyme reader an exclusive VonShef 6.5L Digital Slow Cooker with a RRP of £49.99. To be in with a chance of winning, please fill in the Gleam widget below. You will need to leave a comment on this post, answering the question, which then gives you additional chances to enter if you so wish. Gleam will pick a winner at random from the entries received. If you are commenting anonymously, please give me some way of identifying you as I will be verifying the validity of entries. Any automated entries will be disqualified. This giveaway is only open to those with a UK postal address. Winners will need to respond within 7 days of being contacted. Failure to do this may result in another winner being picked. Prizes are offered and provided by Domu and Tin and Thyme accepts no responsibility for the acts or defaults of said third party. Tin and Thyme reserves the right to cancel or amend the giveaway and these terms and conditions without notice. The activity I would like to do is crochet. I have recently taken this up again after my granddaughter was born. There are so many cute baby clothes to make, it’s hard to decide what to make next. I’m currently engaged on a little bolero for her to wear at Christmas. At the moment it would be getting on with my cross stitched Christmas cards! Oh man, this looks just the thing for this weather! I too love dumplings but have only ever had them plain. I think I’ll follow your lead and add mushrooms next time. I’d like to read the paper all the way through with a cup of coffee! I’d love to be curled up with a book having some ‘me time’ whilst it’s bubbling away! I would have a nice cup of tea and read a good book. 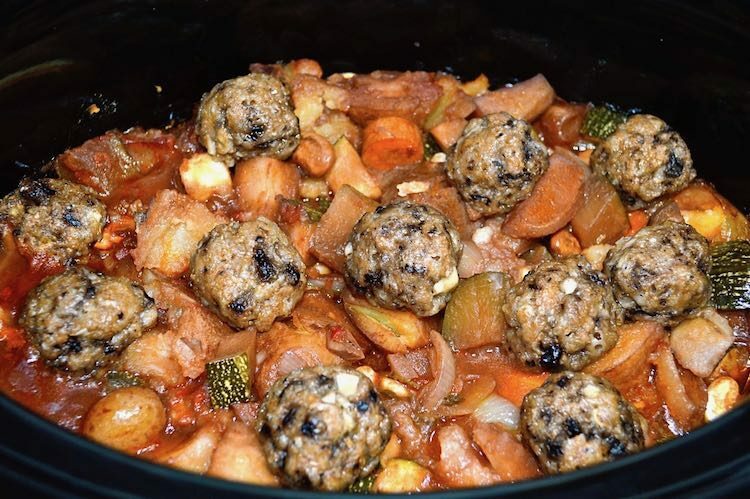 I would set it off in the morning before the kids go off to school and me to work, then we could come home to a lovely stew and warm ourselves up as it is freezing outside at the moment. I love to have a mega read, a good book along with plenty of brews…….strong tea! I like to curl up on my chair in front of the log burner and read a good book. Sit down with a good book and a cup of tea – bliss for half an hour. I would do some yoga,love it! It depends what state the house is in! Would be a good opportunity to catch up on a bit of cleaning or ironing. But if all that’s done then would be nice to catch up with a good book and a cup of tea, or wrap some Christmas presents! Have a coffee and read for a while. What an awesome stew! Published a very similar one recently actually but the mushroom dumplings are an excellent idea. I think i need to try those very soon. Yummed! Dumplings! That’s what makes the perfect stew. Vegetarian recipes are sadly given too little limelight in all the “winter warmer” features so it’s good to see you providing little inspiration. Like the mushroom twist on the dumplings. I normally relax whilst cooking, so if the slow cooker was taking care of that then I guess I’d have more time to concentrate on some festive baking. And if the oven’s off-limits? I’ve got Hamelman’s ‘Bread’ just delivered and I won’t learn without some serious study time. What a delicious veggie stew! I love esp. those mushroom dumplings. I would read a good book, whilst enjoying a lovely hot cup of tea. That sounds absolutely gorgeous. I love the mushroom dumplings, thanks for joining us for the Slow Cooked Challenge. What I WANT to do is read the new novel I got, but instead I would have to read some academic books for my degree! Oh I feel your pain Rose. Truth told I rarely get the time to read these days and I really miss it. oh my word, those dumplings! I’d like to be sat in my comfy chair,reading a good book. Be lazy watching some comedy with some beers and small snacks until the cooker has done all. I would be getting on with my cleaning & ironing. I’d love to sit down with a cuppa and a good book but in reality i’d probably be tidying up! I’d probably catch up on some house-work, house work never ends. But If I do win this slow cooker, it would be a gift for a family member. Take my dogs for a long walk in the countryside. I would have a lovely dinner waiting for me . I will be running after 3 year old twins all day long. Not sure about activity, I’m always ready for a nap. Pesky MS. But I would give this to my vegan daughter and I know she has plenty to do. Dancing, practicing her bass guitar, working, not sure when she sleeps. Oh, to be young. well that would be telling! I might get banned from your blog if I actually told yer! I’d love to call my best friend who now lives down south, we never seem to have the time to really catch up. Do part of a jigsaw puzzle, I always have on the go. I never would have thought of mushrooms dumplings, how inspired!. Oh I love jigsaws and when I’ve lived in a house with enough room I always had one on the go too. Sadly, no room in our current house. I would spend the time in the garden getting more crops ready to fill the cooker over the nest few months! I could visit the farm shop to select the ingredients for the next undertaking. Have a fun filled family day out! Then on arrival home when we are exhausted, dinner is ready! Switch on my turntables, play a few hours of classic ska and reggae, just in time for a nice stew! Catch up with my ironing. meant to add to last comment, both activities are long overdue! I’d go downstairs and do some meditation in my chill out room. Now that paints such a good picture Lesley – can I join you? Thanks Helen. Mushroom dumplings are my new found love. A walk on a crisp Winter’s evening, when the stars are bright, then coming in to the delicious aromas of a bubbling beef casserole waiting for me. I would walk my dog because he cannot go very long without demanding a walk. The annoying little git! I’d study my cookery book ready for the next delight! I would certainly love to blog!! This is my favourite hobby ever and oh.. having a cup of coffee with the cat on my lap too! I’d like a bit of me time but the reality would be taxi driver to my 3 boys to and from their sports! I’d spend some time birdwatching from my kitchen wondow. At this time of year so many different birds visit the sunflower hearts feeder, including nuthatches & redpolls. I never seem to have time to sit and enjoy them. Do find a bit of time to watch the birds if you can Lili, they are such wonderful little things. you have got to have a stew, with dumplings and i cant wait to try these mushroom ones! I would play a board game with my son and read a chapter of my book! A lovely long bath with a glass of wine and a book. Glass of wine and a good book – its so rare I get to read! I would probably do some sewing! The stew looks great – not being a fan of mushrooms I probably would go for the cheese option you normally use – the perfect dish for this kind of weather. Thanks for entering into the no waste food challenge – the round up is finally live, so sorry it took so long! I get home very late from work so I would go to the gym whilst the slow cooker makes dinner. I’ve been trying to get into the habit of doing quick sketches and keeping a daily pictorial journal so that would be my choice of activity while waiting for the slow cook! What a fab idea. I’m rubbish at drawing, but would love to be able to do something like that Louise. It would be great to set aside time to read. Curl up by the fire with tea and my cats. relax and read a good book. Binge watch a good boxset on Netflix with a few cups of tea and maybe a biscuit! I would like to read a few chapters of my book, while drinking a nice cup of tea. I would make the most of a bit of spare time and enjoy myself. Make a cuppa tea and relax with a good tv boxset. Lazy but fun! That would depend who else was in the house! If the kids are around I would spend quality time with them, but if I was on my own I would definitely make it “me time”. No chores – I’d probably have a good pamper and relax. I would curled up on my sofa and put my favourite film on! Dancing around the kitchen with my boyfriend! I’d go into my craftroom and make some pretty cards while my food was bubbling away. I would like to spend more time playing with my baby boy. Love to catch up on my reading! I think for me it would be a good de-clutter. The Christmas deep clean of the house has highlighted to me that there are too many drawers and cupboards in this house stuffed with goodness knows what so it’s time to thin it out! Oh, I’m so with you there Caroline. If I was given some magic extra time I would love to have a good de-clutter. I would like to go out for a walk by the sea, and then curl up with a good book. I would like to continue playing fallout 4 (A recently released computer game). Joy of a slow cooker is leaving it on even when you leave the house so would definitely go out for a nice long family walk. Do the laundry, do the dusting, and then go out for a jog. Just kidding! I’ll be lounging around on the sofa daydreaming. i love to knit, so this would be bliss…slow cooker on and knitting time begins! I would probably take the dogs for a nice long walk and then back for a nice cup of tea! play games with my kids, help them with their homework, read a book. I would love to be out in the garden – pruning, weeding or leaf raking! I would do some competitions to try and win a holiday or treat for my grandchildren. Build a Lego fort with my four year old! At this time of year with so much going on, I’d like to get some sleep! I’d love to do a bit of tidying up in the garden, so many leaves need collecting and the rest needs a little attention! I’d like to curl up on the sofa and catch up on the soaps. I’d like to be wrapping my Christmas presents. Reality is that I’d be doing some jobs – but I’d like to be reading my latest fantasy book. I would like to crack on with my scrapbooking that I started ages ago! Clean as much of my house as I could. I would curl up on the sofa and read a good book. I would read through some more blogs to find more great recipes for the next time I use the slow cooker. Thanks for sharing. I would be spending more time with my family,Great prize thank you for the chance and Merry Christmas. Thank you Kay. Merry Christmas to you too and good luck. I love being able to play with my kids and spending quality time with them. Haha, I know the feeling Richard – one day! I would love to be able to devote more time to my daughter. I’m so busy as I work from home and also look after my 2 year old. I would be so happy if this slow cooker can save me some precious time. Thank you for the chance to win it. while the slow cooker is cooking, I can get on with the baking. I would like to have a bit of me time as strangely do not seem to get much of that these days! I would surf the internet reading blogs and generally getting distracted. I would be baking some delicious cakes. I’d probably spend my spare time doing a bit of gardening – I’ve still got a lot of spring bulbs toput in for next year! I am very happy with my nickname of ‘The Crochet Queen’ so I would sit and happily crochet a gift for a family member while the smell of my delicious stew wafts around the house. At the moment I would love to crack on with the Christmas wrapping, any other time I’d love to be able to take the kids out on a nice long walk and to the park, and come home to something delicious waiting for us. Catching up on my favourite TV shows! I would love to take the dog for a walk to the park. We can have more family time together, playing games, reading books and doing extra homework.